A2Z has a Clean and Simple challenge for September and I thought I’d use the lovely chair in “In the Study” clear stamp set might work out well. The sentiment on the books worked out well here too. Nothing goes better with a stuffed chair than a good book or two. I drew a line under both stamped images to ground them and tie them together. You may be tempted to add something to the white space, but don’t. My post is at A Bit of This and That. Categories: Clean and Simple, Handmade Cards, Hero Arts, One Layer | Tags: 2018, a2z Scrapbooking, Arlene, clean and simple, Hero Arts, stamping | Permalink. Howdy! It’s Karen here with a card using the Hero Arts National Parks Poetic Prints stamp set. I don’t know about you but I love the National Parks. It is on my list to see as many as possible. The inspiration for this card was a card we got from someone with just kraft, black and white. I also decided to go with the Clean & Simple look which is this month’s challenge. In the National Park stamp set there are 4 stamps. I chose these two because I have been to both of them. Also included in the set is the Grand Canyon and Monument Valley. I started out by stamping the 2 images on kraft paper with Memento Tuxedo Black ink. I then colored the images using a white Prismacolor pencil sometimes heavy sometimes light coloring. After you color with the pencil it covers up the black some. I took a Copic Multiliner pen and a Memento Tuxedo Black pen and went over the stamped black lines to make them stand out. The Memento pen is a great one to have around to touch up spots that maybe don’t stamp all the way or over the pencil as I did on this card. As you can see I put some mats behind the images and attached that panel to the card. For the sentiment I used a stamp from Hero Arts set Set Sail and stamped with Versafine Onyx Black ink. Categories: Clean and Simple, Handmade Cards, Hero Arts | Tags: clean and simple, Hero Arts, Karen, National Parks Poetic Prints, Prismacolor Pencils | Permalink. A2Z has a Clean and Simple challenge for September and I chose to work with the Vintage Travel digital kit only available at A2Z Scrapbooking. All of the images are from this same kit.digital kit only available at A2Z Scrapbooking. All of the images are from this same kit. Since it’s a CAS challenge, I made these very CAS. The sentiments are my own handiwork. This post is also at A Bit of This and That. Categories: Clean and Simple, Digital, Handmade Cards, Hero Arts, One Layer | Tags: 2018, a2z Scrapbooking, Arlene, clean and simple, digital kit, Hero Arts | Permalink. Hi everyone! Here’s to a new month! And that means a new challenge here at a2z Scrapbooking Blog! Our challenge this month is Clean and Simple and we’d love to see your project with lots of clean space and very few embellishments! As you know, we’ve changed our rules a bit and participants are no longer required to use Hero Arts products to enter our challenges. Each month we feature a ‘Digi of the Month’ which will be the prize offered to our randomly-chosen challenge winner, and this month it is 7th Heaven Sun Stars Moon! And to sweeten the pot, if you are the randomly-chosen winner and you have used Hero Arts and/or Sugartree Stamps products on your project, you’ll ALSO win a $20 gift certificate to the store! The Winner and Top 3 will be announced on the 7th of this month! Categories: Challenges, Handmade Cards, Hero Arts | Tags: clean and simple | Permalink. Hi! It’s Sue here today. It’s with some sadness that I write that this will be my last post here at a2z Scrapbooking as I’ve decided to step down from this wonderful team of talented and supportive card makers. Now that I’ve retired from my “real” job, I feel that I need to try some new things – not quite sure what they are though, LOL! I was inspired by this month’s “monochrome” challenge and wondered if I could create a monochromatic card. I started with the Scrollwork Stencil, spiced marmalade distress ink and an ink blending tool. I stamped off once to get a more muted tone of orange onto the upper left corner of my card base. I stamped all three layers of the tiger lily using three orange inks (they will be listed below) using my MISTI and then fussy cut the flowers. On a scrap of orange cardstock, I stamped the sentiment from the same stamp set and cut it into a banner. When assembling the card, I decided to pop the middle bloom up on dimensionals. I think that I did OK with my all orange card. The a2z scrapbooking store carries a wide variety of Hero Arts products! Get discounted new releases, sales, grab bags & more. Proceeds from our store benefit Celiac & Behcets disease foundations. Use my discount code sue15 to get 15% off your purchase of $25 or more. If you’re looking for a Hero Arts product you don’t see in store, use the Request Custom Order button from with-in the shop. Categories: Clean and Simple, color layering, Flowers, Handmade Cards, Hero Arts, Thank You Cards | Tags: clean and simple, color layering, Flower Cards, Hero Arts, stencil, Sue | Permalink. Hi! It’s Sue. I have a new card for you. Its a card that could be used for a variety of occasions – celebrations, anniversaries, weddings, new homes, new boat. I kept the colors monochromatic, in line with the current challenge here at a2z Scrapbooking. I printed the “cups” digital stamp and the “cheers” sentiment digital stamp from Sugartree Stamps KN005 Mr & Mrs digital kit with my inkjet printer onto cardstock. 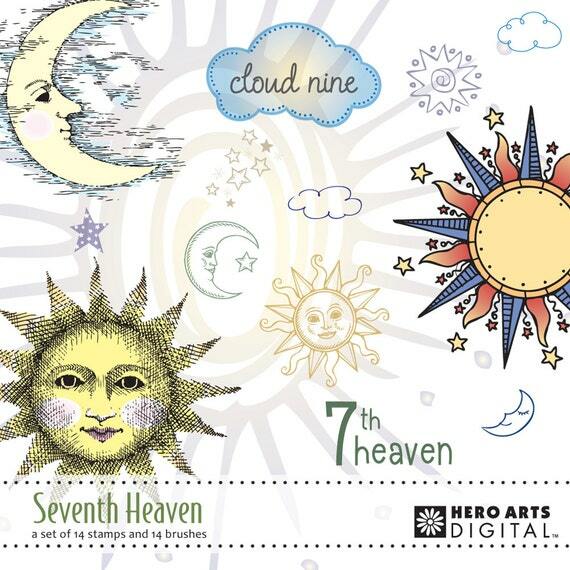 Sugartree Stamps digital kits are available exclusively at a2z Scrapbooking etsy store. I trimmed the panel to just smaller than an A2 card. I added color to the champagne flutes using Copic markers C2 and C3. I had watched people use the “flick” technique with Copics and gave that a try. I flicked from the edges of the flutes, towards the centers. I started with C2, added C3 and went over that again with C2. I think it looks like the light is shining through the champagne. Categories: Challenges, Clean and Simple, Coloring, Digital, Handmade Cards, Sugartree Stamps, Wedding & Anniversary | Tags: clean and simple, Copic Coloring, digital kit, Sue | Permalink. Hi! Sue here with a new card to show you today. Since the monthly challenge at a2z Scrapbooking is “Shape Shift”, I thought that I’d join in the fun and create a card that isn’t the typical rectangular shape. I printed out the “to go cup” stamp onto cardstock using my inkjet printer. I added color with Copic markers. Through trial and error, I have found that alcohol based markers do not make my printer ink bleed while water based markers do make my printer ink bleed. I fussy cut out the image. I then made a top-folding card and carefully traced the to go cup, making sure that there was a bit of overhang of the top of the cup. I carefully cut out the card base. When complete, I found that I had to do a bit of trimming so that the card base didn’t peek out from behind the to go cup. I couldn’t figure out where to put a sentiment, so my card is sentiment-less, at least on the outside. Categories: anything goes, Coloring, Digital, Handmade Cards, Sugartree Stamps | Tags: a2z Scrapbooking, a2z Scrapbooking Store, clean and simple, Copic Coloring, digital kit, Sue, Sugartree Stamps | Permalink. I started by printing out the Floral Border 2 image onto cardstock, using my inkjet printer. I sized it so that it would be the front panel of an A2 card. I added color with Copic markers. For the sentiment, I printed out the “Happy Mothers Day” stamp onto cardstock, again with my inkjet printer. I made two tags, using Stampin’ Up’s Ornate Tag Topper punch. I added the sentiment, matted with purple, to the green tag. I matted the entire card panel onto black cardstock make the card panel “pop”. Categories: Clean and Simple, Coloring, Digital, Handmade Cards, Mother's day, Sugartree Stamps, Tags | Tags: a2z Scrapbooking, clean and simple, Copic Coloring, digital kit, Flowers, Sue, Sugartree Stamps | Permalink. Hi there! It’s Sue here with a new card for you to see. I’ve been gradually learning how to use digital kits for my cards. It’s interesting to see that the more you use them, the easier it is. Imagine that! I used the large sunflower-like card. I printed it out on cardstock, added color with Copic markers and fussy cut the image. I wanted to create a background so that the flower would “pop”. I started with an A2 card panel (4.25″ x 5.5″) of 96 lb bristol because I knew that I would be adding some water. I used Zig Clean Color Real Brush markers in blue/teal colors and scribbled on the bristol. I used a water brush to blend the colors. I kept adding scribbles and blending until I was happy with the panel. For the sentiment, I used another digital kit, printed out the sentiment and added a black mat. Categories: Clean and Simple, Coloring, Digital, Flowers, Hero Arts, Thank You Cards | Tags: a2z Scrapbooking, clean and simple, Copic Coloring, digital kit, Flower Cards, Hero Arts, Sue | Permalink.